Congolese President Joseph Kabila has called on UN peacekeepers to leave his country, lambasting two decades of inaction. Speaking at the UN General Assembly on Tuesday, Kabila vowed to "oppose any interference in the electoral process under way" stating that his government would cover the full cost. 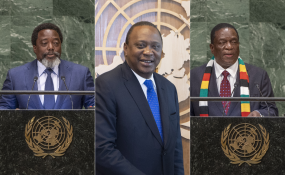 "Despite the enormous challenges that still lay on our path, I reaffirm the irreversible character of holding the elections planned for the end of this year," President Kabila told the UN General Assembly on Tuesday. The vote for a new president has been delayed for two years, but Kabila insists polls will go ahead as planned on 23 December. "Everything will be implemented in order to guarantee the peaceful and credible character of these polls." Yet the combination of insecurity and a deadly Ebola outbreak, makes the prospects of an election in DRC--a country four times the size of France--increasingly unlikely. An attack on the town of Beni, in the east of the country on Saturday, left at least 21 people dead and prompted aid workers to suspend efforts to contain the Ebola virus in the area. "The state has the duty to protect civilians," says Johnson Ishara, president of the youth parliament in North Kivu, the epicenter of the latest Ebola outbreak. "When they [civilians] are killed, it means that somebody has not done their job. It may be the army, a minister, or the President of the Republic. Whoever it is, we want things to change," he told RFI. For Kabila, the flare-up of violence is further proof that the UN peacekeeping mission, known as Monusco, has failed. "Twenty years after the deployment of UN forces in my country and due to the largely mixed operational results, my government reiterates its demand for the effective withdrawal of this multilateral force," he told the UN. "Congo finds Monusco underachieving and I can understand that," Kris Berwouts, author of Congo's Violent Peace: Conflict and Struggle since the Great African War, told RFI. "But I still believe that Monusco always had and still has a dissuasive impact, that the fact of being there has had a decreasing impact on the intensity of the conflict." "Can we still call it a peacekeeping mission when people are killed in the cruelest of manners? Of course not!" says Ishara. "After 19 years, I think that UN peacekeepers should be ashamed of themselves. In Beni, there are people who don't even know the meaning of the word peace." Monusco was unavailable for comment at time of publishing. The UN troops were sent to Congo in 1999, in the midst of a civil war that killed more than 3.3 million people. Nearly twenty years on, insecurity remains rife. "We are tired. We are tired of burying our brothers, sisters, fathers and mothers, every day," comments Ishara, who's also the spokesperson of an NGO called the New Civil Society. Along with other civil groups, he's been demonstrating since Monday against the attacks on civilians, as part of a five-day "ghost town" protest. On Wednesday, shops remained shut and no taxis were running. The insecurity caused by armed opposition groups, led the World Health Organization to warn of a "perfect storm" in the Democratic Republic of the Congo that could cause the Ebola outbreak to spin out of control. Storm or not, "Congo is dedicated to having the elections and wants to organize them in an environment as controlled as possible," comments author Berwouts. Little, however, is under control. There are 80,000 polling stations dotted across the country, with each one allocated five electoral assessors. With less than three months to go till the elections, none of the assessors have been trained, complain civil groups. "We fear that the electoral commission will end up delaying the elections because of this challenge," Jonas Thiombala, a member of le Comité laïc de coordination (CLC), a secular pressure group, told RFI. Add to that, there's controversy surrounding the delivery of the voting machines that are meant to arrive next month. The government has ruled out any help or interference from foreign actors, raising fears of a vote manipulation. "In the last elections of 2011, there were also a lot of delays in the process," says Berwouts. "In the last months, things accelerated and that was due to heavy investment by Monusco and mainly South Africa." This time, relations with both actors are strained. "Many people are concerned that we are going into an election which might not have the democratic quality which is needed," warns Berwouts. At the UN, Kabila lauded his achievements, saying his country was no longer a failed state, and he wants the world to give Congo the benefit of the doubt. Holding elections on time and ensuring they're fair, may give him the credit he's after.